The blood to the upper limb is supplied by 4 major arteries: axillary, brachial, radial, and ulnar. The subclavian artery is followed by the axillary. Its name is changed to brachial artery at the lower border of the teres major muscle. The brachial artery continues down the arm and just distal to the elbow joint, it splits into radial and ulnar arteries, which follow the bones, following which they are named. Radial artery ends by forming the deep palmar arch in the hand, and ulnar artery terminates by creating the superficial palmar arch. Let’s have a brief look at the above mentioned arteries. The axillary artery supplies blood to the shoulder region and the walls of axilla as well as to the distal parts of the upper limb. The first part is proximal to the pectoralis minor. The second part is posterior to the pectoralis minor. The third part is distal to the pectoralis minor. During its path through axilla, Pectoralis minor crosses it on its superficial aspect dividing it into three parts. The axillary vein is medial to the artery and around the second part of the artery, the cord of brachial plexus are arranged; the lateral cord being lateral, the medial cord medial, and posterior cord behind. The brachial artery is responsible for the blood supply to the posterior compartments of the arm. It can be seen as the continuation of the axillary artery at the lower border of teres major. In the proximal arm, the brachial artery is located on the medial side. In the distal arm, it moves laterally to assume a position midway between the lateral epicondyle and the medial epicondyle of the humerus. Profunda brachii artery (largest and first branch). Superior ulnar collateral artery arises near the middle of the arm and accompanies the ulnar nerve. The profunda brachii artery, the largest branch of the brachial artery, enters into and supplies the posterior compartment of the arm. It enters the posterior compartment together with the radial nerve and together they go through the triangular interval, that is created by the shaft of the humerus, the inferior margin of the teres major muscle, and the lateral margin of the long head of the triceps muscle. They then pass along the radial groove on the posterior surface of the humerus deep to the lateral head of the triceps brachii muscle. Branches of the profunda brachii artery supplies adjacent muscles and anastomose with the posterior circumflex humeral artery. 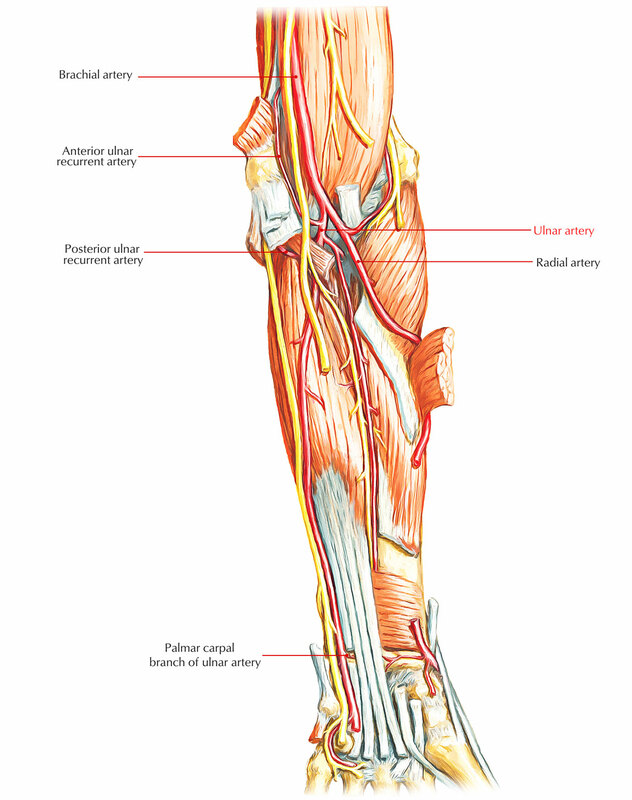 The artery ends as 2 collateral vessels, which contribute to an anastomotic network of arteries around the elbow joint. Medial to the tendon of the brachioradialismuscle and covered only by deep fascia, superfcial fascia, and skin in the distal forearm. The superficial radial nerve lies lateral to the middle one-third of the radial artery. The radial artery leaves the forearm by winding around the lateral aspect of the wrist to reach the anatomical snuff-box on the posterior surface of the hand. The Ulnar Artery is the larger of the two terminal branches of the brachial artery. It supplies the medial aspect of the forearm, wrist, and hand. It starts just below the bend of the elbow and goes obliquely downward, reaching the ulnar side of the forearm near about midway between the elbow and the wrist. Ulnar Artery from there runs along the ulnar border to the wrist, where it splits into its two branches: the ulnar dorsal carpal branch and the ulnar superficial branch. It begins opposite the neck of the radius, around 1 cm below the bend of the elbow and ends into superficial and deep branches in the palm. 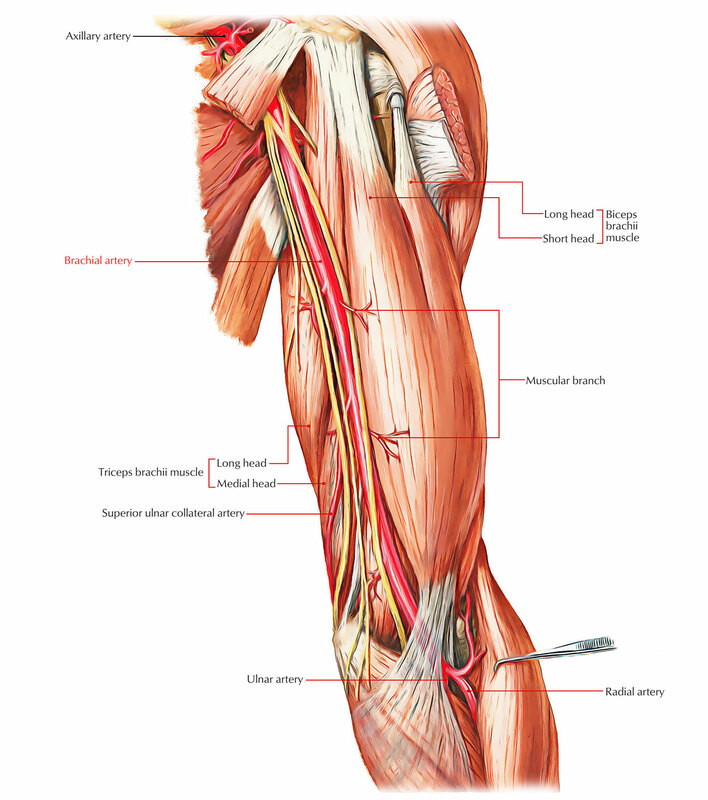 In the upper part of its course, it is located deep to superficial flexor muscles. In the lower part of its course, it ends up being superficial and is located between the tendons of flexor carpiulnaris and flexor digitorum superficialis.